CTMS Market size is set to exceed USD 2.5 billion by 2025; according to a new research report by Global Market Insights. Increasing clinical trials worldwide is the key factor that will augment the global CTMS market growth during the forecast period. Initiatives by government organizations such as NIH to conduct various clinical studies for detection and prevention of diseases will favor segment growth. Moreover, presence of regulatory bodies to enforce clinical trial registrations have increased number of clinical trials in developed countries. Increasing demand for CTMS to manage complex protocol designs in clinical trials as well as demand for clinical trial documentation will drive business growth over the coming years. Furthermore, increasing outsourcing of clinical trials owing to benefits such as improvement in quality of services provided by CROs will spur the revenue size. 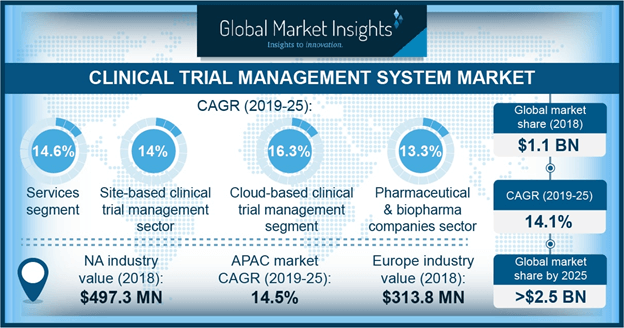 Adoption of clinical trial management system (CTMS) in management of clinical trial to produce effective and faster results is growing over recent years. Presence of large number of CROs in developing countries will positively impact CTMS market growth over the forecast timeframe. Web-based delivery mode segment of CTMS market was valued at USD 668.0 million in 2018 and is expected to show considerable growth during the forecast timeframe. Ability of web-based clinical solutions to offer wide range of applications and provide centralized database for secured sharing of clinical trial information will increase its adoption over the analysis timeline. For instance, DSG provides CTMS solutions that collects and distributes electronically captured clinical data through multiple studies. Increasing applications of web based CTMS should create lucrative growth opportunities thus should boost segment growth over the coming years. Pharmaceutical and biopharma companies segment will experience 13.3% CAGR during the forecast timeframe. Pharmaceutical companies conduct large numbers of studies in-house, and require an efficient CTMS to support study execution. Fully integrated online systems offered by cloud services provide solutions to small scale and medium-scale companies with limited IT resources to set up and manage a complex system. High demand for CTMS in pharma and biopharma companies will positively impact segmental growth. Services segment accounted for 23.3% revenue share in 2018 and is anticipated to witness lucrative growth over the forecast period. Clinical trial system providers, companies and contract research organizations (CROs) offering wide-range of clinical trial management services are projected to boost business growth. Wide-range of services including site monitoring, clinical project management, drug safety, quality assurance, payment services, site selection, data management, biostatistics, and regulatory strategies offered by CROs and other healthcare providers will further augment segmental growth. Site based segment is expected to show 14.0% CAGR during the analysis timeframe. Site based CTMS offers various solutions to improve business relations, support consistent process, increase protocol compliance as well as manage work among the staff and across protocols. Functional attributes provided by site-based solutions will augment the segmental growth during the forthcoming years. Europe CTMS market was valued at USD 313.8 in 2018 and is estimated to show substantial growth over the analysis period. The growth is attributed to factors including high enrollment rate in clinical trials, convenient access to patient population, centralized healthcare systems and skilled investigators in the region. Well-established healthcare infrastructure in Europe and adoption of advanced technologies to support clinical trials will foster the regional business growth. Eminent industry players operational in clinical trial management system market includes Bio Clinica, Bio-Optronics, DataTrak Internationals, Forte Research Systems, DSG, MasterControl, Medidata Solutions, Oracle, MedNet Solutions, Merge Healthcare (IBM Watson), Parexel Informatics, Omnicomm Systems and Veeva Systems. Industry competitors implement strategies including new software launch, acquisition and collaborations to maintain position in the market. For instance, in March 2018, Oracle Health Sciences announced the outcome of a novel study that discovers present status of precision medicine initiatives, its challenges and the future consequence of this discipline on life sciences and healthcare communities. The study was conducted in 2017 by GenomeWeb and sponsored by Oracle Health Sciences.